In a split second, your life can change. 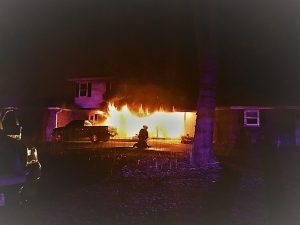 Imagine being awakened at 4:30am on a dark and cold morning, because your house is on fire. You and your family quickly evacuate and are now standing by helplessly watching everything you own go up in flames. You want more than anything to go back in to save your son’s pet, Smoke, but no one will let you. This was the heartbreaking reality for my friend and colleague, Trish Beatty, on March 24th, 2017. Visualize yourself leaving your home on a Thursday evening to go on weekend vacation. Nineteen minutes later, you get an urgent call from your neighbor telling you to come right back because your house is burning. When you arrive thirty minutes later, your road is blocked off with firetrucks, your front yard is filled with firefighters, and your house is already gone. This was the devastating situation for my friend, Jim Fetters, on May 4th, 2017. On separate occasions, I recently had the opportunity to sit down with each of them. In slightly different ways, they both shared that they stopped asking why it happened and started asking what they can learn from it. Let me reveal the six powerful, life-changing lessons that I learned from them. Thank you for sharing these lessons with us, Trish and Jim, after going through one of the most tragic experiences ever imaginable. #1. Asking for help is ok. Immediately after the fire, Jim’s friend Pete sincerely inquired, “Can I help you?” Feeling empty and emotionless, Jim replied, “No, I don’t need help.” Jim told me that the hardest thing was asking for help because he thought it was a sign of weakness. For his whole life, Jim thought he was the one who was supposed to be helping others… not the other way around. Thankfully, a couple of days after the fire, Jim went to the park to “figure it out” with a piece of paper and a pen because “that’s all that was left.” Today, Jim and Trish both realize that they have so much more than what meets the eye. They have an incredible support system of family and friends who want nothing more than to be helping hands or listening ears. Jim commented, “I am now stronger because I asked for help.” Trish expressed, “I lost a lot, but I gained even more.” Think about your life’s challenges and obstacles. Who can you ask for help? You likely have a willing support system, too. #2. People are willing to serve. Even if you don’t ask for help, people want to serve. Trish recalled, “People that didn’t have a lot of time or money dropped everything to give.” Trish’s husband, Greg, vividly remembers seeing his best friend from grade school drive up during the fire with sweatshirts and boots. Jim’s friend, Tom, gave him clothes and let him stay overnight. His neighbor from across the street, Dave, handed him a cup of soda and a key for his house while saying to Jim, “You’re welcome to come in any time.” Jim’s friends who lives three houses down, Liz and Bob, offered Jim freezer space to save his tasty fish, deer, elk, and pheasants. At 10:00am every day, Jim had coffee with Deb Shook, our mutual friend, to keep him focused on his unexpected to-do list. Right now, who will you serve with the gifts that you’ve been given? #3. You positively impact others. Trish is the longtime General Manager of the West Allis Wisconsin Athletic Club, which has one of the best racquetball communities in the country. On Saturday, May 13th, the members and staff hosted a benefit for her family. When talking to Trish about the event, she mentioned, “I felt like I was witnessing my own funeral. The room was jampacked. I never realized how much of an impact I had on people.” Jim is a courageous veteran. About one week after Jim’s house burned down, the firefighters who were on the scene stopped by to visit. Jim immediately thanked them. Caught off guard; however, they were there to thank him. With tears in his eyes, Jim quietly shared, “I thanked the firefighters, but the firefighters were thanking me because I am a veteran.” While you may not always realize it, you are making a meaningful impression in the world. #4. Don’t get caught up with having too many things. In my book SHIFT, I wrote about people’s attitude toward materialism. According to United States census data, the average American home in the 1950s was about 1,000 square feet. Today, the average home is about 2,500 square feet. Houses have ballooned. On top of that, in 1950, over 3 people lived in each home. Today, less than 3 people live in each home. According to Northwestern University research by psychologist Galen Bodenhausen, although American consumer activity has increased substantially since the 1950s, happiness levels have flatlined. Trish said, “Losing our stuff was somewhat cleansing and has decreased stress.” Be careful with the more, more, more mentality. Do you have too much stuff? If so, where can you declutter? #5. Prepare for what you can. Everyone has thought about having a fire. However, few, if any, think it will actually happen to them. According to Trish and Jim, you can’t fully prepare. You can, however, take some action to minimize the pain. Jim said, “To this day, I remember the rotary dial phone call that I made with my insurance agent in 1973. Thankfully, I bought the policy.” Don’t put it off. Get homeowners or renters insurance. Trish stated, “Unfortunately, we didn’t have our house inventoried. Trust me. It’s much easier when you still have your stuff.” Document and take pictures of your belongings now. Jim commented, “I lost all of my hunting and fishing pictures. I wish I would have used technology.” Back up your favorite pictures and videos on a digital, cloud-based storage system. Trish suggested, “Practice in the pitch dark. Test your fire extinguishers. Practice going to your family’s gathering spot. Test your alarms regularly. Practice putting your shirt over your mouth so that you can breathe better.” Practice. Test. Practice. Jim added, “The money that I spend on a gym membership and for my Well Coach, Jackie Geib, is well worth it. What if I was in the house and needed my strength and endurance to get me out of a life or death situation?” Do your best to keep yourself fit and healthy. In your own life, where do you need to be better prepared? #6. Some things don’t make sense. As I was wrapping up my conversation with Trish, she asked, “Can I show you a video that captures the inside of our house one day after the fire that will make us laugh?” “You bet,” I responded. It felt so incredibly real that I could seemingly smell fire. As I observed just about everything burnt to a crisp, I noticed that the Doritos, potato chips, and Goldfish looked brand new, fresh, and crisp (no pun intended). I was smiling and questioning, “How can a fire burn an entire kitchen, yet miss the snacks?” Trish responded with a chuckle, “Some things don’t make sense.” What do you need to stop stressing about and let go of once and for all? Not everything in life needs to make sense in the moment or even ever, for that matter. Have you ever had a fire alarm go off at home or at work? If so, what did you do? Did you immediately evacuate? Or, did you ignore it and assume it was a false alarm like most of us do? A few hours after my conversation with Trish, she sent me the following text message that confirmed today is not a false alarm: “Derek, I forgot to mention one thing. My family and I never really used our fine china or wore our expensive clothes because we saved them for special occasions. Think about all of the little girls who want to wear the princess dresses, and then about us as parents stressing out about it. The adults are the ones who have it wrong. Now I get it. Everyday is a special occasion.” Powerful. Don’t wait for a fire alarm to wake you up. Tomorrow is not a given. Live your best life right now because every day is a special occasion. ACTION: Write down three material things that you own, but don’t use. Consider donating the items to someone who could truly benefit from having them.